LARAMIE, Wyo. — Blinddog Smokin’s larger-than-life new album High Steppin’ is a kaleidoscopic romp through the wild side of roots music. The disc’s nine songs ricochet from rock ’n’ roll to juke joint blues to New Orleans jazz to raw Americana, all supported by the band’s twin pillars: hot ’n’ greasy funk and frontman Carl Gustafson’s epic storytelling. High Steppin’ follows 2014’s Decisions, a collaboration with soul-blues legend Bobby Rush that earned a Grammy nomination for Best Blues Album. Decisions includes the song “Another Murder in New Orleans,” which enlisted another legend, Dr. John, to tell its tale of street violence. The tune was widely played on Americana and blues radio, and was used by the New Orleans Crimestoppers organization to raise awareness. Blinddog Smokin’s imaginative video for “Another Murder in New Orleans” mixes performance footage, cartoons and live action actors, and has received more than 110,000 views on YouTube. 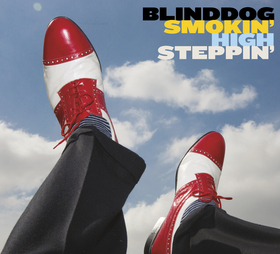 Blinddog Smokin’s 11th release, High Steppin’ kicks off with “Pimp Shoes,” an ebullient, percolating funk gem that displays the group’s spectacular ensemble. “’Pimp Shoes’ is not about pimps or shoes,” says Gustafson. “It’s about attitude. When a man becomes the captain of his soul, and he’s mastered who he is, it comes out in his posture, in his pose, in his walk. That’s what that song’s about.” On a more literal note, there’s “Big Behind,” an ode to a lady’s posterior largess that straddles funky soul-blues, rock and — with its sweeping pedal steel guitar — honky-tonk country. High Steppin’ is set for a July 17th release date on Silver Talon Records exclusively distributed by City Hall Records in tandem with The Orchard. “I Caught Her Lyin’” goes deeper into the country tradition to offer Blinddog Smokin’s version of a mountain lament — surrounding Gustafson’s heartbroken yarn with an Americana-perfect framework of crying violin, grinding guitar and his appealing worn-leather voice. “Lady’s Playin’” changes the locale to New Orleans. That song’s a Crescent City funk powerhouse, with bold horns, a scalding six-string solo and chanting group vocals that celebrate la difference. Similarly, “Don’t Put No Money on Me” — a wickedly funny loser’s lament — sounds like a drunken Mardi Gras street parade, while “Tell ’em Shuffle” is a straight-up Chicago blues. Blinddog Smokin’s marvelously eclectic sound and approach is the result of Gustafson’s literal and musical world travels. He and the band have toured the planet numerous times since 1994, putting more than a million road miles on their vehicles — which include Gustafson’s bicycle. Gustafson, who describes himself as an adventurer and philosopher, has plenty of tales of his own. And his book It Ain’t Just the Blues, It’s Showtime: Hard Times, Heartache and Glory Along the Blue Highway chronicles Blinddog Smokin’s experiences on the road. That knowledge is deep. Markowitz is the Oscar-, Grammy- and Golden Globe-winning writer of the song “(I’ve Had) The Time of My Life” and the composer of soundtracks for the hit Steve Carell film Crazy, Stupid, Love and many others. And High Steppin’ is the third album in a row he’s produced for Blinddog Smokin’. “We didn’t hit our stride in the studio until we started working with Donny,” Gustafson says. The other essential ingredient to Blinddog Smokin’s broad stylistic mastery is the ability of its players. The core members of the group comprise one of the finest modern bands in American roots music. Dynamic drummer and vocalist Chuck Gullens started with the Blinddogs in 1994 in Laramie, Wyoming, shortly after Gustafson and the band, then named Bluestone, returned from traveling the Middle East and Mediterranean, playing for troops on a 49 day DOD tour. Versatile bassist Roland Pritzker joined in 2000, followed by keyboardist and exceptional vocalist, Mo Beeks — whose own, earlier band, Lock & Chain, gave R&B singer Chaka Kahn her start back in 1972. In 2009 came back-up singer and bassist Chris White, and virtuoso guitarist Chalo Ortiz also entered the fold, followed quickly by backing vocalist Linda Gustafson, who plays feminine yin to her husband’s hot-dogging, high stepping yang in concert. Gustafson’s own musical tale begins in Laramie, his hometown. “My first exposure to blues was hearing Willie Dixon,” he recounts. “My parents went to a little club outside Cheyenne, and my brother and I — we were six and eight years old — stayed in the car. When we heard the music, we were absolutely fascinated by it, so we peeked in the windows. Then I started sneaking around listening to blues whenever I could. I had to sneak, because my father was a classical pianist and said the blues was ‘Satan’s music’ and ‘not culturally acceptable.’ He’d only gone to the club to socialize with relatives.